The aroma of our WHISKEY SMOKED BROWN SUGAR is absolutely intoxicating....even though it contains no alcohol. This irresistible flavor combination enhances sweet and savory dishes - even a great cup of coffee! It makes the most delicious marinade for salmon, beef, chicken and pork....or mix it into baked beans, sweet potatoes or carrots for a sophisticated boost of flavor. 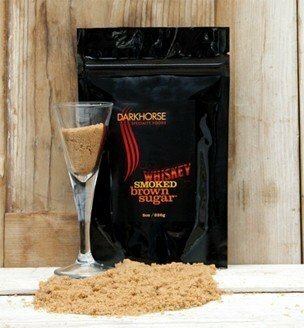 Our WHISKEY SMOKED BROWN SUGAR is a fabulous addition to chocolate cake, apple pie, or the whipped cream on top! It also makes a decadent caramel sauce to drizzle over poached pears, vanilla ice cream or bread pudding. You’ll have fun experimenting with our WHISKEY SMOKED BROWN SUGAR - it’s destined to become a new pantry essential! INGREDIENTS: Naturally wood smoked sugar, invert sugar, cane molasses, maltodextrin (dent corn), beta cyclodextrin, modified food starch, natural flavors, med. chain tryglycerides.